When we were in New Zealand, Queenstown specifically, we stumbled onto this adorable café tucked at the base of the gondola. We were craving something warm and sweet, so decided to wander in. After scouring the glass display for a solid 10 minutes, I finally settled on an almond milk flat white and a ginger pistachio bar (I can't say no to ginger). 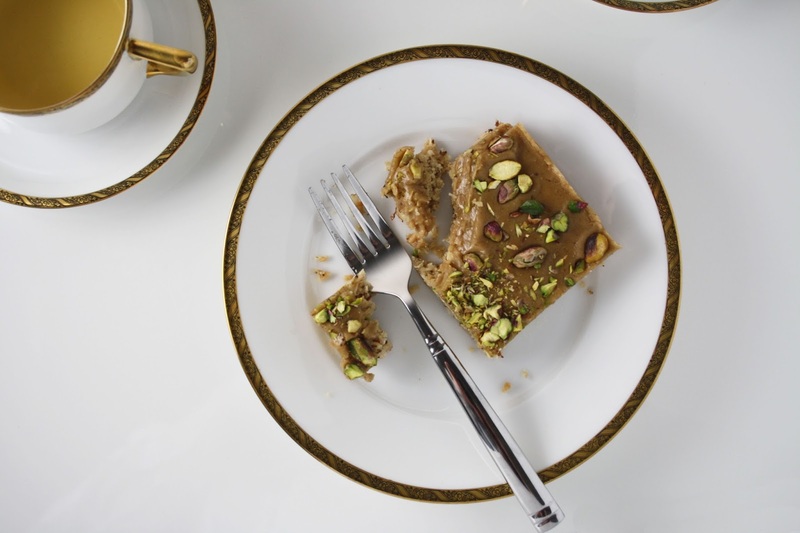 The bar was everything I could have asked for in an afternoon treat -- sweet, yet tangy from the ginger, and soft enough to eat with a fork, yet crunchy from the baked bottom layer and pistachio topping. After fighting over the last bite, I knew almost immediately that I would have to try making them once we were back home. I settled on a dairy and gluten free version and couldn't be happier with the results. I hope you like them as much as I do! Many thanks to Sabatier for sponsoring this post! 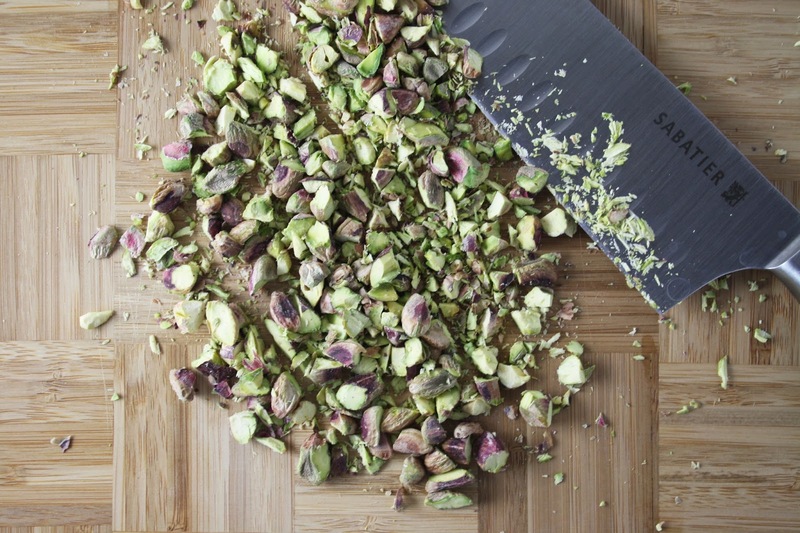 The chopping knife made nut and ginger prep an absolute breeze, and I quickly fell in love with the versatility of the butcher block. 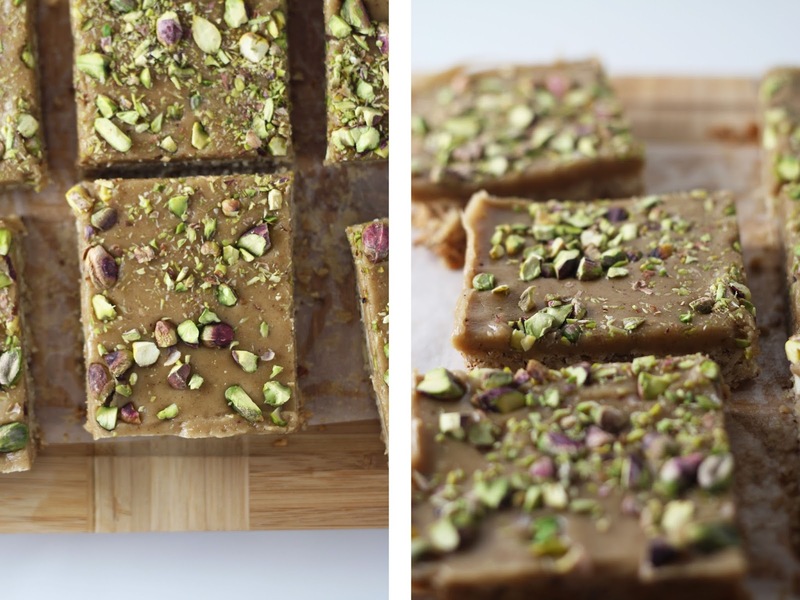 These bars are definitely a decadent treat. 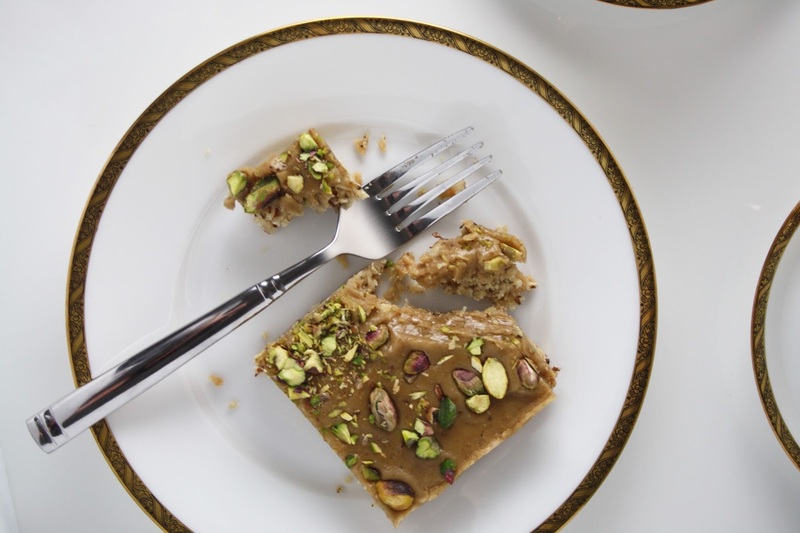 Perfectly paired with an afternoon cup of coffee or tea to counter the sugar. 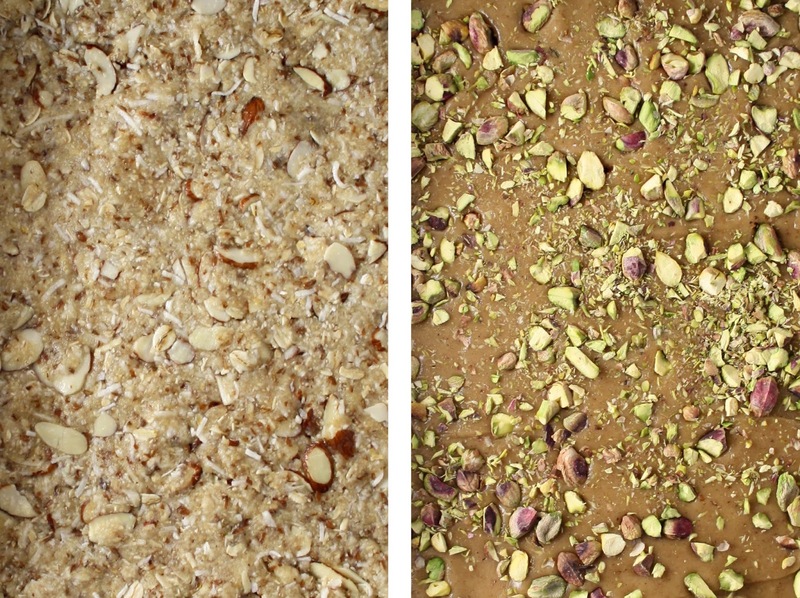 Though I cut them into 9 bars here, I later cut each bar in half - a much more manageable serving size / dose of sugar. Preheat oven to 340F. Line a square pan with parchment (cut to size) and set aside. In a large bowl, stir together the base layer dry ingredients, and set aside. In a small pot over medium heat, melt the coconut oil, brown rice syrup and maple syrup. Once melted and combined, whisk in the sugar. Allow the mixture to heat, while continuing to whisk, until all the sugar has dissolved. Pour the hot mixture over the dry ingredients and use a rubber spatula to combine until no visible dry bits remain. Transfer the mixture to the prepared baking tin and gently press down with the back of the spatula. Using damp hands, continue to spread and press the mixture evenly throughout the pan. Bake for 20 minutes, until the edges are set. The centre will harden on the counter as it cools. Allow the bottom layer to cool for 1 hour. After 1 hour of cooling, prepare the top layer. In a small pot over medium heat, combine all the top layer ingredients, except for the icing sugar. Once melted and combined, gradually stir in the icing sugar. Taste after you've added 1 cup, and assess if it needs more sugar. Pour the mixture over the base. Use a spatula to evenly spread the icing. 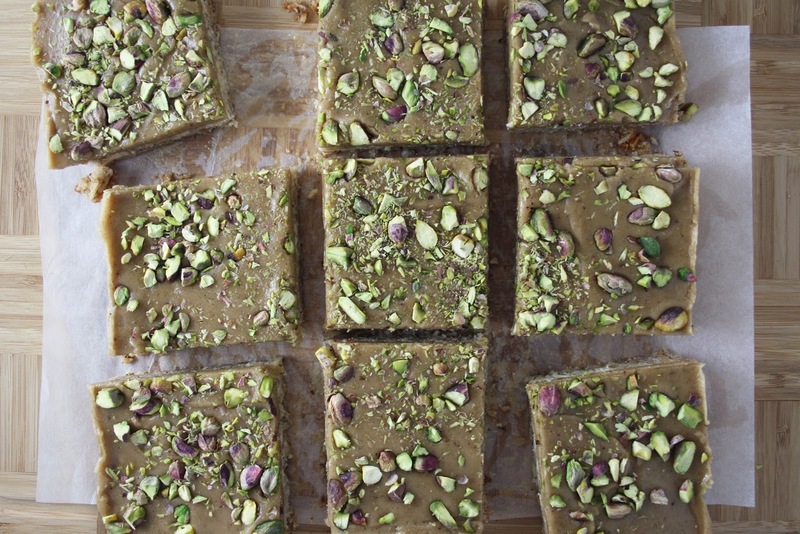 Sprinkle with pistachios, then use your hands to lightly press the pistachios into the icing. Allow to set for 1-2 hours, before removing from the pan and cutting into 9 squares.